An itinerary that leads to Menidrisiotto,a land of solid wine-making traditions and rich in history, art and landscape. Leaving from Mendrisio's historic centre, which can be covered in a short time on foot, passing through the streets which open onto beautiful courtyards. There are ancient churches and buildings, including the St. John the Baptist church, with a beautifully decorated stucco interior; the convent, which is now an art museum; St. Maria delle Grazie; and the baroque building Palazzo Pollini. 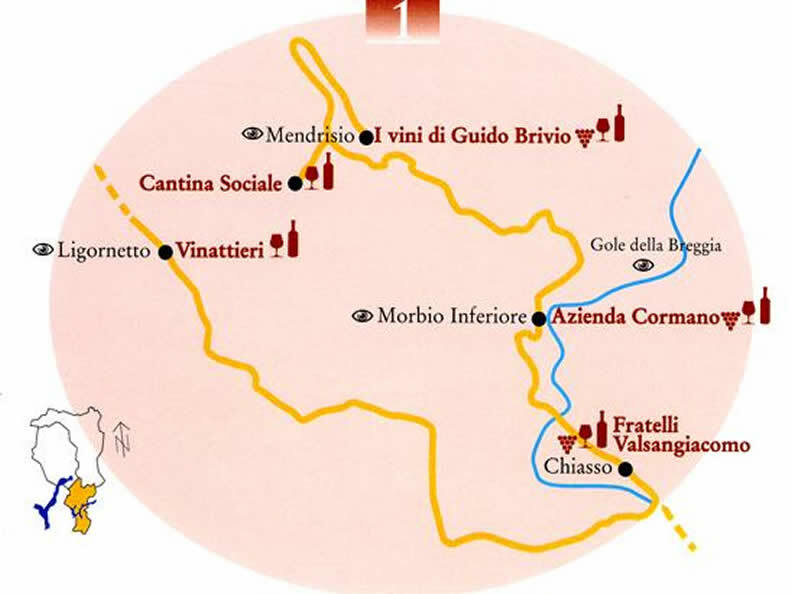 In Mendrisio, there are some important wineries: The Cantina Sociale, Guido Brivio and the Gialdi (tours and wine-tasting by appointment). It's worth a trip to the cellars. Built at the foot of Generosa and shaded by enormous trees, they are ideal places to ripen grapes thanks to the presence of natural fresh air breezing through. Some are still operational, while others have been transformed into "grottini"? Going back from the start, in Mendrisio?s Piazza del Ponte, continue towards the Castel San Pietro. Here, wine grapes are ripened with wonderful results by the small companies Avra and Kopp-von der Crone. Go down to Morbido Inferiore. The Santa Maria dei Miracoli sanctuary has conserved the image of the blessed saint for centuries. Nearby, amongst the vineyards, is Cormano, a wine company that offers some fruity Merlots. The Breggia region is particularly interesting in terms of geology. In just a few minutes' walk from the cement-works, there are rocks sculpted by nature. In the vicinity is the Locanda del Ghitell, situated near the mill of the same name. The itinerary continues towards Chiasso, were we find the Valsangiacomo company, which boasts a long family tradition, and then we end iin Ligornetto, with a view of the Vinattieri company and its new, innovative building, and the museum Vela, where you can admire the works of art by one of this region's sons.